Here’s a look at what it is, how technicians get certified, as well as its importance. The North American Technician Excellence, commonly known as NATE, is an independent organization responsible for certifying air conditioning installation and service technicians. This is done through a knowledge-based testing procedure. Its scope includes the Environmental Protection Agency as well as the American Society of Heating, Refrigeration, and Air Conditioning Engineers. 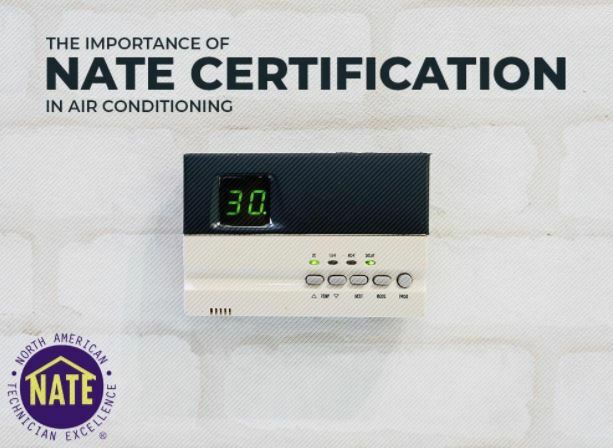 Technicians who wish to become NATE-certified are required to pass both core and specialty parts of either an air conditioning service or installation test. The required score is 70 or better. Specialties include other aspects of the test such as heat pump, air conditioning, air distribution, and oil and gas heat. This test sets industry standards; after all, those servicing your home heating and cooling systems need to be armed with in-depth knowledge and skills. Businesses and homes alike need to have an assurance that the air conditioning technicians working on their systems are the most qualified for the job. There’s no better way to ensure this than with the NATE certification, which is the clearest sign that the technician has gone through all the necessary training and testing. The fact is that HVAC systems are complex; they require extensive technical and mechanical expertise to ensure peak performance. For all your air conditioning needs, trust only O.K. Heating and Air Conditioning. Since 1976, we’ve been consistently providing maintenance and repair services that put the best value for the customer’s money. For the highest level of HVAC care, call us today at (925) 337-8319. We’d love to hear from you.